The Sons Of Liberty - Bradlee Dean: Tyrants Inevitably Reap What They Sow! 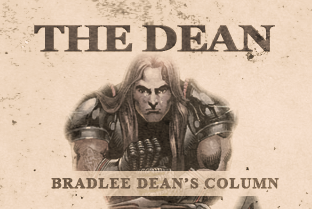 Home - The Dean-Bradlee Dean: Tyrants Inevitably Reap What They Sow! "God, if you are there, strike me dead!" Many years later God did accommodate when Mussolini and his mistress were condemned to death. Mussolini said, "Let me save my life and I will give you an empire!" then began shouting "No, No." They were both executed along with main members of his cabinet on April 29, 1945. Their bodies were savagely beaten then hung upside down at an Esso gas station in the Plazzale Loreto in Milan. Marie Antoinette, riding to Notre Dame Cathedral for her wedding, bade the soldiers command all beggars, cripples and ragged people to leave the line of the procession. She could not endure the sight of these miserable ones. Soon after, bound in the executioner's cart, she was riding toward the place of execution amid crowds who gazed on her with hearts as cold as ice and hard as granite. When Foulon was asked how the starving populace was to live, he said, "Let them eat grass." Afterward, the mob, maddened with rage, caught him in the streets of Paris, hung him, stuck his head upon a pike and filled his mouth with grass (Galatians 6:7). Herod Antipas and Herodias were responsible for the imprisonment and execution of John the Baptist, and Herod himself attempted to plot the death of Christ. In the summer of A.D. 39, Antipas' money and territory were turned over to Agrippa, while he and his wife were exiled, and Antipas died miserably.